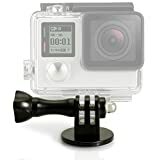 iGadgitz mount for attaching your GoPro Hero5 Black, Hero5 Session, Hero4, Hero3+, Hero3, Hero2, Hero1, Hero Session action cameras to a tripod, monopod or selfie stick with a standard 1/4″ thread. Made of rigid plastic, durable and sturdy. Simply plug your camera over the top of the adaptor and secure with thumbscrew. Package Contents: 1xTripod Adapter for GoPro. 1xBlack Screw and Cap. The connection is a universal screw fitment and should fit 99% of all tripods and also Monopod, Flexipod Tripod, Selfie Sticks etc. This listing is for the Mount only. Camera and other accessories in the images are NOT included. iGadgitz tripod mount for attaching your GoPro Hero5 Black, Hero5 Session, Hero4, Hero3+, Hero3, Hero2, Hero1, Hero Session to a standard tripod, Monopod, or Selfie Stick with a standard 1/4″ thread. This entry was posted in Discount Photography and tagged Adaptor, Black, GoPro, Hero, Hero1, Hero2, Hero3+, Hero4, Hero5, iGadgitz, Monopod, Mount, Screw, Selfie, Session, Stick, Thumb, Tripod by Ball Photo. Bookmark the permalink.